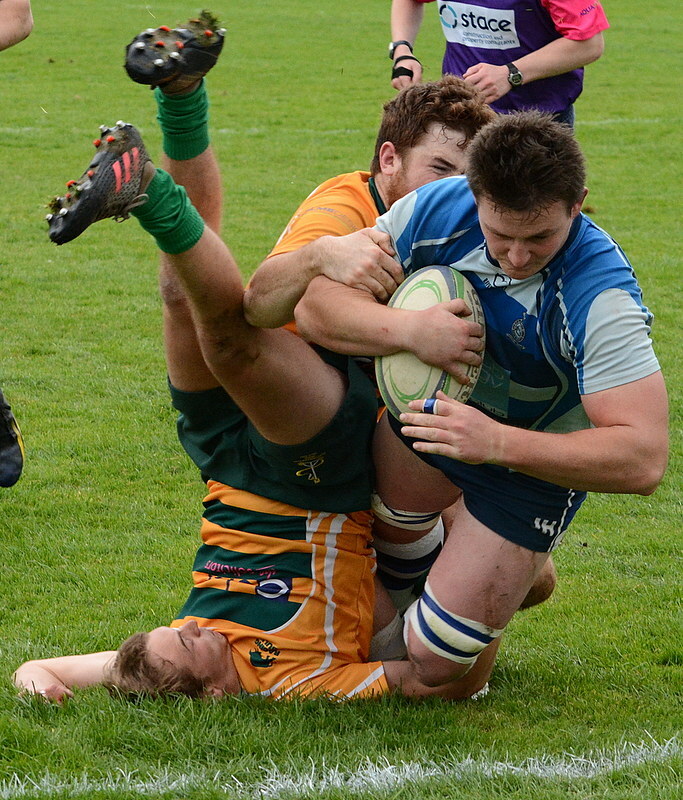 On a blustery afternoon Otliensians entertained Northallerton in a fixture between two sides undefeated in the league. Ensians played in to the wind in the first half and it was evident from the opening exchanges Northallerton wanted to keep the ball tight and prevent the home side from moving their pack of forwards around the field. Both packs fought hard to gain the ascendancy but it was Northallerton who started to take control. Midway through the half the visitors won a line-out inside the Ensians 22, they rolled a maul to within five metres of the line and then from second phase possession the North prop forward crashed over between the posts. The conversion gave the visitors a deserved 7-0 lead. Chasing the game, Ensians tried to run the ball at every opportunity but the wind and the slippery conditions led to numerous mistakes. The North forwards continued to control the set pieces and the visiting fly-half turned down a couple of penalty opportunities to kick the ball to the corners. With five minutes of the half remaining the visitors secured possession from another line-out inside the home 22 and the inevitable rolling maul led to a second try. The extras were added to give North a 14-0 lead. From the kick-off Joe Armitage secured the ball and following some controlled handling from backs and forwards Otliensians made a rare foray in to the North 22 where they were awarded a penalty in front of the posts. The home side elected to run the ball and from third phase possession Joe Armitage went over. Connor Bateman added the two points to leave the score 7-14 at half-time. Playing with the elements, Ensians started the half brightly, a break from fly-half Cooper inside his own 22 took the ball deep in to North territory only for some last ditch tackling to deny the home team. Ensians continued to ask questions of the visitors defence, however, following another line-out and driving maul its was the visitors who increased their lead midway through the half. An excellent conversion made the score 7-21. Otliensians stepped up a gear, and with the visitors pack visibly tiring began to exert pressure on the North line. With 15 minutes remaining lock Matty Taylor made a break down the blindside to score and reduce the lead to 12-21. Then with less than 5 minutes on the clock Ali Campbell gave a superb inside pass to Will Prest who forced his way over. The extras reduced the margin to two points. Otliensians continued to knock at the door but could not force an opening. North were awarded a penalty on the stroke of full-time and their fly-half only had to find touch to end the game. However, Sam Featherstone took a superb catch to keep the ball in play. The forwards moved the ball towards the centre of the field to try and create a drop goal opportunity but were again penalised for going to ground. This time North made no mistake and fired the ball to touch to end a pulsating game. Northallerton played the elements well and defended heroically in the last quarter. Otliensians will need to reduce the number of mistakes particularly as they entertain Wallsend in the first round of the Junior Vase next Saturday. There were 19 + players on the team sheet on Thursday night, only 12 made it to Keighley’s ground two days later. What with grand finals, work, grandmas, vans stuck? & even one man deciding to leave the club an hour after the team sheet was posted; it’s no wonder team manager Tempo is bald! The mood was very subdued for the boys who made the effort, it was kick off before Tempo finished ringing round & chasing players (Daz Cooley left work on his new extension to help out, “What a hero” his wife was heard to say as he left home). Fair play to Keighley who lent three players to Ensians to make a game of it, Nash, Linden & Phil the groundsman. With Toby Keep, Jim Dyson & Pete Bonner in the front row, there was plenty of ballast. Mick Wilson & Bret were in the engine room with the polish flash (Lukasz) in the backrow with Dan Ridgeway & Ben Jones. Jacob Wragg went to his favourite scrumhalf position, while Captain Conner put the 10 shirt on (Dom Oddy was at the grand final). Daz Cooley played 12 with winger Ryan Lowe playing 13. The 3 Keighley boys filled the 2 wings & fullback for Ensians to make for a slightly disjointed team!. The pitch was very wet & just playable in places so the plan was to use the big boys in the pack to keep it tight. Keighley have a good, solid old head at 12 who likes players to play off him. He was always going to cause problems for Ensians. Two minutes into the game, Keighley’s backs cut through to score & with heads still down a shafting was on the cards! From the kick off Keighley came straight back but with Jim Dyson putting a few trade mark hits in with winger come flanker Lukasz [who’s not known for his tackling], Ensians worked their way into the game with Mick, Bonner, Ben, Dan & Toby running hard into the opposition & lone jumper Bret taking all his own ball & some of Keighley’s when it went in straight at the lineouts. A good break by Dan from number 8 with Jacob taking it on, turned the opposition & when Jacob passed it out to Daz at centre, he made more yards before putting Conner away to score & even it up at 5 apiece. Some of the Keighley players looked tired already so the team chat was to keep taking it to them, but Keighley aren’t a team to lie down & it was Ensians time to defend with the forwards & backs tackling their hearts out until Keighley broke through & scored 3 more tries before half time to make it 22 – 5. The half time team talk was to work hard & keep it tight against the tiring Keighley boys. Jim, Bret, Jacob & Dan’s fitness was starting to show with Toby also getting a second wind (after doing nothing but eat since the end of the season). After another break by Jacob, Nash was taken out while going in to score but because Conner touched it down, the penalty try was withdrawn to make it 22 – 10, 15 minutes into the second half. More good runs from Daz & Ryan put Phil the groundsman away down the wing, he was under the sticks on his second attempt to make it 22 – 17 (prop Toby now kicking for goal). For the first time in the game the Ensians boys believed they could win, but with 10 minutes to go, Jim tackled a Keighley player as they were attacking and twisted his back. An ambulance had to be called, as he fell awkwardly so the game was blown up early. The game was played in good spirits despite all the problems at the start. Many thanks to Keighley who loaned the players to make the game a contest. It would have been unfair to Keighley if they had lost after helping Ensians out.